Hollywood is one of the most popular film industries with a reach to all parts of the world. It is also one of the biggest money making industries in the world, and while there are failures, there are also successes. Some of them are barely in their teens and aren’t even 18 yet. The youngest to win a Screen Actor’s Guild Award for her popular role, the 9-year-old Aubrey Anderson-Emmons is known for her Lily character in Modern Family. She was also the youngest to walk the red carpets in 2012 Emmy, there she walked the red carpet again in the following year. At the age of 7 itself, her net worth was around USD 1 million. Before she turned 7, she had accumulated a net worth of USD 2 million. She is high on bank balance owing to her cuteness factor and popularity, primarily in the Disney show Good Luck Charlie. She has been appearing in commercials ever since she was a baby; to make her character in Good Luck Charlie appear realistic, the directors had asked her mother about her favourite things which were then used in her room. With a net worth of USD 2 million before she hit 18, Bella Thorne is one of the most popular young female stars. Apart from being an actor, she’s a singer and has been compared to other Disney stars like Selena Gomez and Miley Cyrus. Television shows such as My Own Worst Enemy and Big Love, movies like Blended (with Drew Barrymore and Adam Sandler), and Shake-it-Up (Co-staring another child prodigy Zendaya) are some of her popular tv series and films. One of those guys who didn’t set out to become an actor, Rico incidentally gained so much fame and money as an actor that he’s among the richest Hollywood actors below 18. 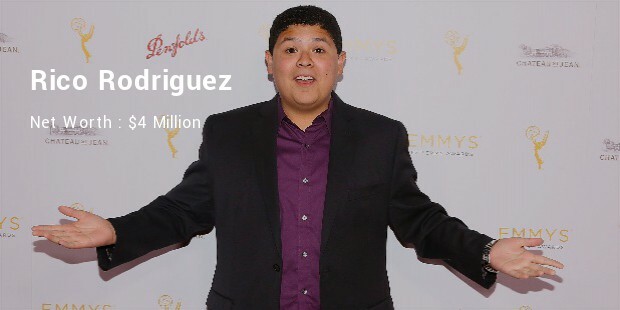 He gave acting a chance because his sister Raini had a lot of success and fun as a part of a Disney show. He’s a part of ABC’s hit show Modern Family. He had a net worth of USD 4 million when he was just 16. He entered TV although he had a dream of being NASCAR chef on-board the moon mission. 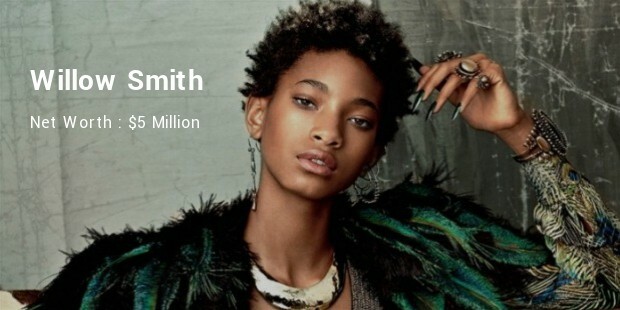 Born in this century itself, in the year 2000, Willow Smith already has a net worth above USD 5 million. She has had a great start to her career with talents like acting, dancing, and singing, at her perusal in plenty. She became the youngest artist who Jay-Z’s Roc Nation Label signed, and ‘Whip My Hair’ became an instant sensation in the year 2010. She’s also part of a social project- Project Zambi. She, along with her siblings, work on this project and the proceeds go towards education and well-being of children in Zambia. Clearly, there’s no minimum age to stardom and success. These guys have defied all age-old records of net worth for young stars while also gaining immense popularity for their gigs.